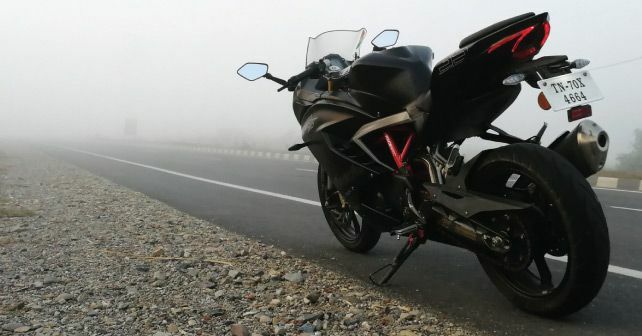 Another month, another road-trip with the Apache RR 310. Well, to be honest, when I first took this motorcycle out on a long journey, I was pleasantly surprised with its touring capabilities. This time I embarked on another quick trip to the hills near my hometown. Now in my last report, I made it clear that the engine, suspension and tyres work flawlessly over smooth as well as rough roads. And once again, I’d like to sing praises of this trio again, especially its 313cc engine. The way it comes to life in the final quarter of the rev-range is simply intoxicating. The top-end grunt is phenomenal and makes cruising at high speeds an effortless affair. In the hills, the RR feels equally impressive. The first three gears are short ratio, which means you never run out of juice on tight and twisty roads. The tyres hold up confidently, too, and I think they’re very well engineered for all kinds of road conditions. I am not a fan of the bike’s over intrusive ABS though. While speaking of faults, the chain has rusted and emits a lot of noise. I cleaned and lubed it myself, but it didn’t have any positive effect. Another thing that I’ve noticed while riding it in traffic is that the engine tends to cut out quite often, especially in 2nd and 3rd gear, as soon as you clutch in. I hope this issue will be rectified in the next service.